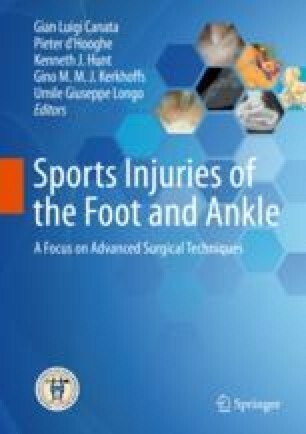 Anterior ankle impingements are very frequent syndromes after ankle sprains. The diagnosis is clinical and based on physical examination and palpation. Anteromedial ankle impingement is a very simple entity with a quite constant bony impingement due to osteophytes. Arthroscopic removal of synovitis and osteophytes provides very good results. Antero-lateral impingement is very frequent but must alert on an occult or misdiagnosed chronic ankle impingement. Antero-lateral impingement is usually a soft tissue impingement, and recent studies showed that this syndrome is closely linked to instability with micro-instability and rotational instability. In these conditions, arthroscopy is the best tool not only to assess this impingement and the pathologic ligament but also to perform a localized antero-lateral synovectomy and a ligament repair.